Ospreys slumped to their fourth defeat in the Pro12 this season after being outplayed at home by Connacht. The last time the Irish province defeated Ospreys on their home turf was 10-9 at The Gnoll in November 2004. Sam Davies' penalty and a Dan Baker try gave Ospreys a good start, but Connacht replied with two Jack Carty penalties and a Matt Healy try to lead 11-8. Bundee Aki went over for Connacht and, although Justin Tipuric replied, Craig Ronaldson's boot sealed an Irish win. The result leaves Ospreys with just one win from their opening five fixtures and 10th in the table, while Connacht climb to second - level on points with leaders Scarlets. Ospreys had Wales forwards Tipuric, Paul James, Aaron Jarvis and James King in their matchday squad, along with Eli Walker, but were without front-line regulars Dan Biggar, Scott Baldwin and Alun Wyn Jones. In-form Connacht have been far less disrupted by international call-ups during the World Cup but made five changes from their win over Zebre, with Carty, Darragh Leader, Shane Delahunt, Aly Muldowney and Eoghan Masterson all coming into the team. 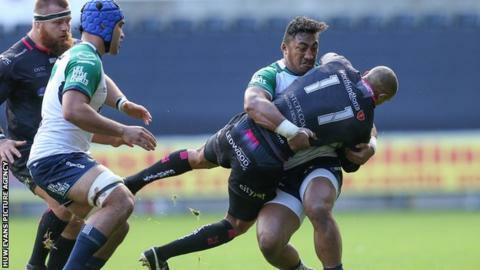 Ospreys struck first blood with Davies kicking a penalty on three minutes and he added a second after the break, but the fly-half missed three other penalties and also failed to convert either of his side's tries. Opposite number Carty also kicked two penalties for the visitors, but was also wayward with three more kicks at the posts. Ronaldson took over kicking duties after half-time and was on target with both his attempts, crucially adding a penalty and converting Aki's try. After Davies and Carty had exchanged kicks, back-row Baker had put Ospreys in front with a try created with a dart up the left by Walker and good link work from full-back Richard Fussell. But when home centre Josh Matavesi was sin-binned for killing the ball at a ruck in front of his posts, Connacht took advantage. Carty added three points from the resulting penalty and then wing Healy went over on the left, exploiting space from the blindside of a scrum courtesy of Kieran Marmion. The second half saw a change of referee with Welshman Sean Brickell replacing Irishman Andrew Brace. After only four minutes of the restart Connacht stretched their lead to 10 points with a try for the lively Aki after good work by his co-centre Ronaldson. Ospreys brought on Tipuric and James, making his first appearance for the region for three seasons after rejoining from Bath. Flanker Tipuric went over for the Ospreys' second try with 11 minutes remaining after good work by Davies, Scott Otten and Dan Evans. But Connacht still led 18-16 after Davies failed with the conversion, and two minutes from time Ronaldson kicked a penalty to cap Connacht's victory. "There are aspects of that game that are unacceptable to us. "There are so many individual mistakes, we couldn't get into any shape or patterns which reflect what we're trying to do on the training field. "We improved to a certain degree but we didn't respect the ball enough - there were a couple of shambolic turnovers in that second half." Ospreys: Richard Fussell; Tom Grabham, Ben John, Josh Matavesi, Eli Walker; Sam Davies, Brendon Leonard; Ryan Bevington, Sam Parry, Dmitri Arhip, Lloyd Ashley (capt), Rory Thornton, James King, Dan Baker, Sam Underhill. Replacements: Scott Otten, Paul James, Aaron Jarvis, Rynier Bernardo, Joe Bearman, Justin Tipuric, Tom Habberfield, Dan Evans. Connacht: Tiernan O'Halloran; Darragh Leader, Bundee Aki, Craig Ronaldson, Matt Healy; Jack Carty, Kieran Marmion; Denis Buckley, Shane Delahunt, Rodney Ah You, Quinn Roux, Aly Muldowney, Eoin McKeon, Nepia Fox-Matamua, Eoghan Masterson. Replacements: Dave Hefferman, Conan O'Donnell, Finlay Bealham, Ultan Dillane, John Muldoon, Ian Porter, Rory Parata, Niyi Adeolokun. Assistant referees: Sean Brickell, Aled Evans (WRU). Citing commissioner: Dennis Jones (WRU).